This is the fourth in a series of four posts entitled 2nd Mile 101. We hope these writings can help answer the questions of who 2nd Mile is and why we do what we do the way we do it. 2nd Mile is seeking a God-sized goal: wholistic transformation. In order to pursue this it is essential that we know who we are as 2nd Mile as well as who we are not. To do this we have a several core values that inform our actions, approach, and ministry. First, 2nd Mile operates with a specific neighborhood focus. We seek to be for and present in the Brentwood neighborhood, which is defined by Main Street on the east, Interstate 95 on the west, 12th Street on the south, and Tallulah Avenue on the north. This is not to say, we will never minister or serve outside of our pre-determined boundaries, but it is to say that we know we cannot be everywhere at once and if our geography grows too large the deconcentration of our efforts lead to diluted and lessened impact. Within the Brentwood neighborhood, our next key approach centers on always seeking a tangible presence. You cannot know or be known without being present. Because of this 2nd Mile requires all staff and encourages volunteers to make their home in the Brentwood community. A large part of the activity and ministry of 2nd Mile takes place not at youth programs on our turf, but happens as we know and seek out our neighbors, as we serve in local schools, play at the local park, and support local businesses. Doing so develops empathy, affection, and connection to the Brentwood community. Tangible presence means that 2nd Mile is joining together to make the victories and challenges faced by Brentwood our victories and challenges as well. Building from this presence, 2nd Mile knows that comprehensive transformation is not possible by our efforts alone. So, where others already doing great work in their own areas of expertise we seek out collaborative partnerships. It is our desire to work together with others with whom we share common goals for the Brentwood neighborhood. This means partnerships with churches, schools, non-profits, city agencies, and businesses that encourage mutual flourishing for all parties, but most of all for Brentwood. There are two divergent approaches to community development work. One is for outsiders to come into a neighborhood and say, “Here is what we have to bring to the table for you.” The other looks to a community and says, “What are the strengths and resources that already exist here that we can join alongside in?” 2nd Mile Ministries rejects the former and embraces that latter, which is called assets based community development (ABCD). Since there are so many great individuals, skills, and resources already available in Brentwood, we make it our goal to listen to and work with the community. ABCD is something I do with you, not that I do to you and 2nd Mile highly values this approach. Finally, and tying all the elements together, 2nd Mile’s final core value is leadership development. Oftentimes, under-resourced communities are marked by two mindsets, one of fatalistic nihilism that fails to hope and sees the neighborhood as corrupt to the core, or one of escapism that villainizes the neighborhood and makes the goal to "get out and never look back". As a result of this dynamic, few people are equipped to be positive leaders and role models from and for the community, and the ones that may be best qualified often leave while vowing never to return. 2nd Mile seeks to offer a third way. A path that declares that our students were made for purpose and that unique purpose includes using and developing their gifts and abilities so that they can be the change agents who transform their own neighborhood. This means that all of 2nd Mile’s efforts set out to raise up and develop students into leaders and disciples who will lead Brentwood to flourishing. By focusing on these five key values, 2nd Mile is able to make sure every activity pushes us towards our end goal, that we would see the Gospel renew lives and communities so they are transformed in every way. This is the third in a series of four posts entitled 2nd Mile 101. Our mission is to seek to see the Gospel renew lives and communities so they are transformed in every way. We hope these writings can help answer the questions of who 2nd Mile is and why we do what we do the way we do it. Imagine you are walking along some railroad tracks (for safety’s sake, hopefully not on them) when you see parked up ahead the unmistakable look, feel, and sound of the circus coming to town. There’s the lurch of the tent being raised. There’s the buzz of a gawking, excited crowd. There’s oversized footprints of clowns (bringing a tinge of fear). And, the whole neighborhood has come out to take in this spectacle. By noon the next day, elephants are stomping, trapeze are flying, and popcorn is being flung in the air with glee. Everyone who could fit in the door has a great time. And they go home talking about the sights they saw with good-natured excitement. Then after maybe another show or two, the tent is disassembled, the railcars are loaded back up, the clowns leave (or did they hide in your basement?). And the circus rolls away. Perhaps to come back next year. Or possibly not. And within 24 hours the kids are complaining about being bored and how nothing ever happens here. And within a week or two the trampled and trudged upon grass has regrown at the former circus site and there exists not a single trace that it was ever there, save some select, fading memories. Unfortunately, this circus tent mentality is the way that many American Christians view ministry in communities like Brentwood. Roll into the neighborhood with resources the local community can’t possibly match. Spend a few hours or a weekend playing hopscotch and maybe sneaking a Bible verse in here or there. Be sure to get some photos of “our” kids with “those” kids and head back across the bridge before nightfall. And within a week or less, those who were ministered to at best have forgotten the experience and at worst feel like they were victims of “drive-by love”, who were used to teach someone else about the “least of these”. But, imagine instead a different kind of edifice than this tent. Imagine a soaring cathedral, perhaps like one of those built in Europe centuries ago. Imagine towers and domes that rise far above any kite (or tent). Places of worship built by the combined efforts of thousands of laborers, skilled and unskilled, over decades or even many generations. Imagine the craftsman who spends his whole life making tiles that will fill an atrium, knowing full well that it won’t be until his grandson is of age that an artist will be needed to paint the ceiling. Close your eyes and picture a majestic structure that is built to stand for centuries, maybe even millenia. A majestic structure that is built for the glory of God, so that one day, hundreds of years later people will walk into this cathedral and stand in awe at the wonder of God and the handiwork of his beloved creatures. But all of this . . . is just a building. Brick and mortar without breath nor life. Imagine how much greater the glory that goes to our God when a community, a neighborhood, or a people are so transformed by the Gospel of Jesus Christ and what He has done for them that an entire directional segment of town radiates the glory of God. Imagine a different city where when people hear Pearl Street on the news they think not of crime or yet another school transformation plan, but instead rejoice and know that this is a neighborhood where a tremendously redemptive God is doing a great work among a people that He cherishes and they are joining Him in it. This second approach, the cathedral, is what 2nd Mile has set out to do since its inception. The goal is accomplished a lot slower than with putting up a circus tent. The results come at a trickle and sometimes you even need to strain and squint your eyes to see them coming around the bend, but the results glorify God for eternity. Veterans of Christian community development work, who have had their blood, sweat, and tears in their communities for decades, are vocal about the fifteen year rule. They say, “If you are going to start a ministry in an under-resourced community, do yourself a favor and don’t expect to see any tangible results for at least 15 years. They say this because communities like Brentwood didn’t get turned upside down overnight, so they aren’t going to be transformed any quicker. They say this because if the organization is started by community outsiders (as they so often are, but that a whole different blog post), those who are investing must take time, must take years to devote themselves to listening to the community and being transformed themselves before their service begins to sharpen. They say it because it takes time to build up trust and good will in any environment if you want it to last for the long-haul. So, at 2nd Mile, we take a long-term approach. We start with students as young as five years old and follow them up to adulthood. We move into the neighborhood (or remain in the neighborhood) and listen to what our neighbors have to teach us. We say “I’m sorry” when either our heart or our actions begin to edge towards a circus tent. And we lay brick after brick building up Brentwood, the community of people, to positively radiate God’s glory for all of eternity. This is the second in a series of four posts entitled 2nd Mile 101. Our mission is to seek to see the Gospel renew lives and communities so they are transformed in every way. We hope these writings can help answer the questions of who 2nd Mile is and why we do what we do the way we do it. To understand the existence and mission of 2nd Mile Ministries one needs to go all the way back to the beginning. No, not to 2004 when Articles of Incorporation were filed. No, not to the 1960s when a series of social, political, and economic forces combined to entrench poverty in the Brentwood community. No, not to some other flashpoint in American history. We must go all the way back to the very beginning. To Genesis chapter 1. In the beginning, God created all things and he created them in relationship. One helpful way to conceptualize this is to picture the biblical Adam and the relationships he encountered. Adam was in relationship with God, with Eve (and eventually other people), with creation, and in a relationship with his own self through his thoughts and emotions. Further, as time went on and the population expanded, humanity came to be in relationship with systems and structures such as education, religion, government, financial, and so forth. In the beginning, all things stood right. All things flourished. And there was no such thing as poverty. But, the interconnected state of shalom did not remain. Soon, shalom was vandalized and all of these relationships began the break down. Adam’s intimacy with God was replaced with fear. A breakdown of relationship. Adam’s knit relationship with his wife became blame-shifting and accusation. A breakdown of relationship. Adam’s peaceful relationship with work, the garden, and creation became one of toil, frustration, and danger. A breakdown of relationship. Adam’s previously undisturbed inner life became fraught with shame. A breakdown of relationship. And these relationships have continued to erode. Our world is marked by a profound sense of brokenness. People are separated from God. Family and neighbor relationships bare the more visible marks of discord like in-fighting, separation, and betrayal, but also the more subtle sins like gossip or the cold shoulder. Similar breakings mark our relationships with creation, work, self, and systems. Nothing works the way that it ought to. A sense of exile pervades the universe, even in good times, we feel that all these things just aren’t what they could or should be. And all of this brings us closer to why 2nd Mile exists. We need to understand this vandalism of shalom if we are to ever understand how it can be undone. For the reality is that, yes, Brentwood, the community where 2nd Mile labors, is faced by poverty, but when properly situated we must understand that all of creation is faced with poverty. The material poverty of a community like Brentwood is just one element of a much greater breakdown of the way things ought to be. If our eyes are really opened, there is no place on this earth we can go and not see evidence of how these relationships have been broken and damaged. In Christ, God is reconciling all things and all relationships, back to himself. Our relationship with God is to be healed. Our horizontal relationship to one another is to be healed. Our relationship with creation, with self, and even one day, our broken systems are all to be healed. And how has he done this work? By the cross. The same cross that secured God’s people eternal life and a personal relationship with our God is the cross that promises to bring about healing in all of the brokenness of the Fall. In the cross, there is a promise that whatever ails Brentwood and every other community has a remedy. Further still, Jesus has commanded his followers to be a part of this mission. As He commanded us to pray for his Kingdom to come, so too, He has equipped every person who trusts in Christ to be an agent of transformation and proclaimer of the Victory of the Cross in every space they inhabit. Grander still, He has promised that the flourishing state of shalom, where God makes his dwelling with men and He is making all things new, is where our final home will be. There are many stories that must be understood to explain an organization like 2nd Mile, but we must start with entering into the grand narrative into which every other story fits. This is the first in a series of four posts entitled 2nd Mile 101. We hope these writings can help answer the questions of who 2nd Mile is and why we do what we do the way we do it. This is the mission statement of 2nd Mile Ministries. It is the mandate that we seek to live out each day in our lives and our ministry. 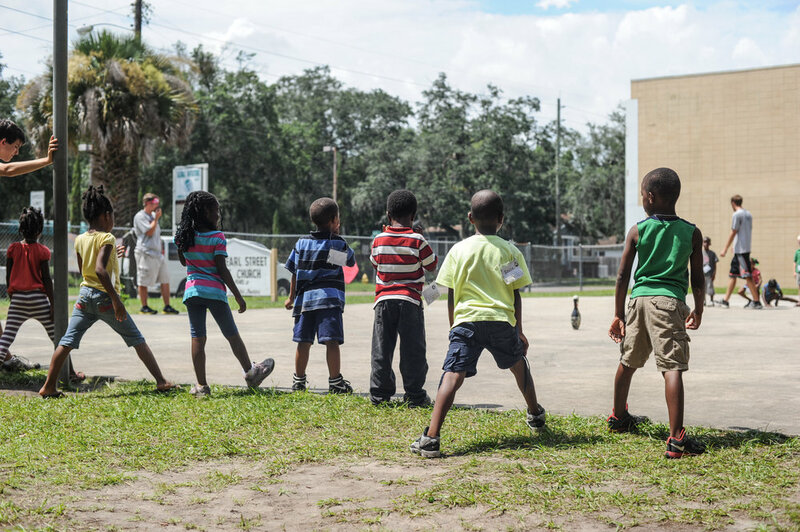 2nd Mile is more than an after school program. It is more than youth Bible study. And it is more than tossing a basketball and snacks out to give some kids something better to do. We are enlivened and pushed forward by this mission and vision for our community. 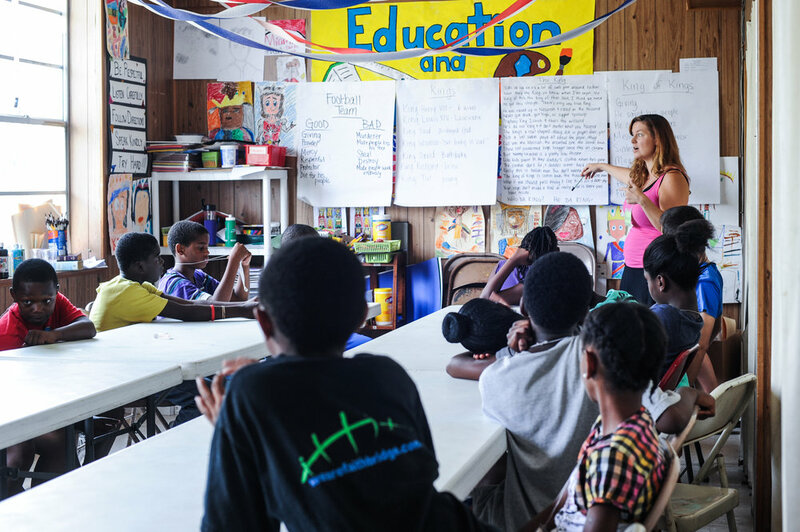 2nd Mile is a Christian community development ministry that centers its life in the Brentwood neighborhood, just north of downtown Jacksonville. The neighborhood is faced by many challenges and disparities, but is also marked by people of tremendous gifting, generosity, and resilience. Our goal is to use the resources and skills that already exist in the community to bring transformation to our neighborhood. We are seeking to see the Gospel . . . This mission starts with the Gospel. The Good News about Jesus Christ, who came to the earth to bring the Kingdom of God. This Gospel declares the forgiveness of sins, the opening of free access to the throne of God, and the reign of grace in the life of all who will believe it. Further, however, this Gospel empowers the vision of 2nd Mile Ministries. Without the Gospel of Jesus, we are powerless. The message of Jesus shows us how to live and also invites all who call on his name to join in his mission of bringing about Kingdom transformation everywhere we go. Further, the Gospel is where the heavy-lifting of work like 2nd Mile’s takes place. On our own, we don’t have the wisdom, perseverance, or skills necessary to do this work, but by the empowerment and working of our God who has called us to himself, we are able to push on towards the goal. We are seeking to see the Gospel renew lives and communities. . . .
At 2nd Mile, we believe in renewal. We believe redeeming that which is broken is not just about building up, but about restoring things back to their original intention. This renewal is to take place on the individual level as well for corporately. We seek to see growth and development in individual lives in our community. The small victory that only impacts one person is part of the mission. So, when J.J. makes the honor roll or understands Jesus in a deeper way, we embrace it and celebrates. But further, renewal takes place on the large scale and in the group as well. So, when 1,000 community members join together for a safe, positive event at the Family Fall Festival or when 20 college students from the Midwest come to Brentwood and experience a renewal that they can bring back to their own communities, we celebrate as well. This renewal is to take place in the small things and the large things. It is to take place in the short term and the long term. It is to take place in the lives of individuals and in entire communities. The end goal for 2nd Mile is wholistic transformation. We desire to see positive change in every aspect of our community, those we minister to, and ourselves. This means growth spiritually, socially, academically, professionally, and physically. For us, if a student grows up through 2nd Mile’s youth programs and is equipped to graduate on-time, resolve conflict in healthy ways, goes to college, and successfully starts a thriving career, but does not walk with Christ, it does not meet our full definition of success. Similarly, if a young person encounters 2nd Mile and deeply follows Christ, but does not experience transformation in other areas of life, where the Lord desires for them to thrive, it too falls short of our definition of success. We seek not partial or temporary solutions, but wrap-around impact that touches and transforms every area of life and every element of our community. We want to get it right and see flourishing and redemption pour out of Brentwood. We desire to see God glorified in our lives and community. We set our hopes on a future vision where this community, which has so much to offer, fully builds itself into a place of renewal, redemption, and wholistic transformation. We are seeking to see the Gospel new lives and communities so they are transformed in every way. Originally published on February 17, 2017. There are many ways in which the gospel of the Lord Jesus Christ has been authenticated and affirmed; the empty tomb, His resurrected body personally observed by hundreds, as well as the sacred and non-sacred written testimonies of those called and impacted by the gospel. In addition to these powerful "witnesses ", God has provided a more personal authentication; and that is our lives. The gospel is again confirmed through the lives of people who know without a shadow of a doubt that nothing in and of themselves merits God’s saving grace. Yet God would grant good to the unfit! Unfit not only on divine terms, but often on human and social terms! It is a bit humbling and anti-culture, to cling to the label of God's foolishness, but that's me. The Lord has brought me from a mighty long way! I am evidence that the gospel of Jesus Christ is true and deserves all acceptance. As I begin the process of transitioning into the Executive Director role at 2nd Mile, I cannot help but look back over my life and see what God has done, and how the gospel is the foundation in my new role as a leader and transformative agent in Jacksonville's Brentwood community. I am not advocating that my role is what makes the gospel good in the sense of human promotion or positional authority. But rather to express that my primary relevance in this world, to Jacksonville, to Brentwood, to 2nd Mile is that the good I have, and any good that I am is in and from Christ Jesus. I am a witness and affirm the gospel, Jesus Christ the same yesterday, today, and forever. My story is that He saves, that He cares. Like the hymn writer says, he has heard my “faintest cry”. I am a witness that the gospel is still good, that He reaches not for the favorable, but to those who call upon Him and place their trust in Him. Yes, the gospel is still good, and He has unparalleled compassion for our low estate and human condition. As I think about the ministry of 2nd Mile, I don’t know what all the future holds, but for sure I trust and expect that Jesus will be Jesus, and that the good news of the gospel will always be good news.